The 10% savings rule says you should save about 10% of your income for retirement. If you have no idea how much to save, it gives you a starting place, but this is NOT a one-size-fits-all-rule; more of a general guideline that may work for you. In reality, the more you make, and the later you start saving, the more you need to save. If you started saving in your early 20s and consistently saved 10% of everything you made, the 10% savings rule would work. But how many 20-somethings do that? Most people find themselves in their mid-40s or -50s when they first give serious thought to saving for retirement. If that’s you, and your career is doing well, a 10% savings rate is probably not going to be enough. But 10%, or any amount of regular savings, is better than none. When doesn’t the 10% rule work? Everybody has a different financial situation; different ages, marital situations, pension amounts, careers, etc. There is no way one savings rule can apply to all those different situations. If you are a high-income earner, you will need to save much more than 10% of your income if you want to maintain a similar lifestyle in retirement. An alternative to saving more would be a planned lifestyle downsizing once you retire: a smaller home, less expensive cars, more home cooking, and so on. 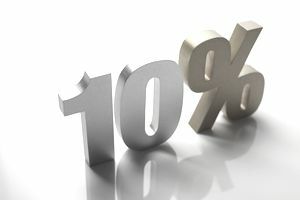 What if you can’t save 10%? If you can’t save 10% of your income, don’t get discouraged and give up. Take a good look at the facts and set a savings goal that you can achieve. If you are just recovering from a divorce, job loss, or death of a spouse, it is going to take time to get your finances in order. Here are 8 Steps to Starting Over Financially After 50. If you can’t save enough because you are an over-spender, get serious about living within your means. Check out 5 Types—And the Money Mistakes They Make to figure out what may be the cause of your over-spending. You’ll also find insight in 5 Key Components to Your Relationship With Money. Traditional IRA or Roth IRA? How to determine which is best. Could a 10% savings rate be too high? Amazingly enough, some people save too much. Once you have enough (plus a little more) to finance the retirement lifestyle you want to lead, cut back on your retirement savings. People who are in that situation and yet continue to forgo any extras and save more each year are over-saving. Just as it is a struggle to get some people to save more, it can be a struggle to get over-savers to save less and use some of their money to go enjoy a few more things. There are plenty of rules of thumb like the 10% rule, but all are general in nature and don't take into account your unique financial attributes. You can find calculators online that drill down on your finances and give you a more accurate estimate of how much to save, but the best way is still to meet with a financial planner who can look at all of your information and create a saving plan that will set you up for success later in life.